Friday’s ground-breaking ceremony for the four-lane expressway the Chinese are building in Kampong Speu’s Samrong Tong district, which will shorten the driving distance from Phnom Penh to Preah Sihanouk province to 190 kilometres (presently 240 km) and cost $1.9 billion, was the platform from which Cambodia and China defended the People’s Republic’s financial involvement in the Kingdom. 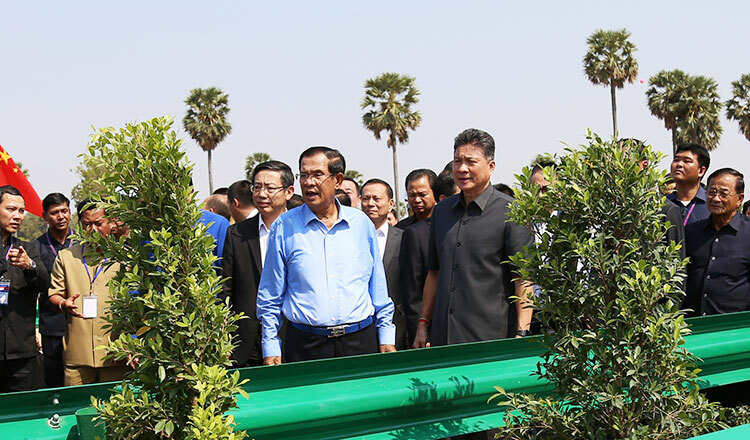 Prime Minister Hun Sen presided over the ceremony and stated that Cambodia’s economy is growing but still needs financial support, and that China is a major partner in helping expand Cambodia’s infrastructure and reduce poverty – but China doesn’t control Cambodia. “I would like to tell other foreign development partners that I don’t turn down partners. Please invest here and please continue to provide loans to Cambodia – because we need them. It is [erroneously] said that we deeply rely on the Chinese, prefer them, and therefore hinder others doing businesses here. “I told China’s Vice Foreign Minister, who is here today, that if China wants to control Cambodia we don’t allow it. And, China doesn’t have a policy to control any countries, he added. Chinese Vice Foreign Minister Kong Xuanyou, stated that Chinese investments in Cambodia are contributions to the development of the country and boost its economic growth – and in no way financial traps. In the last two decades Cambodia received Chinese investment capital, mainly for agriculture and the agro-industry, the industrial sector, infrastructure, and services and tourism, to the tune of $14.7 billion; two-thirds of Cambodia’s $6.4 billion in loans on a bilateral basis came from China.